Now, of course, that is quite a doozy of an attempt at “what is anthropology?”! A shorter version may be found in my preferred textbook for Introduction to Anthropology and Anthropology 2018: “a scholarly discipline that aims to describe in the broadest possible sense what it means to be human” (Anthropology: What Does it Mean to Be Human? 2018:5). Anthropology might be in some ways considered a form of radical listening. That radical listening begins with a generous definition about what human life includes. As part of its study, Biological Anthropology includes non-human primates and human evolution. Biological anthropologists have listened and studied with all primates. Anthropologists have been at the forefront of a generous interpretation of our humanity, including Neandertals & Denisovans as part of the family. Anthropology has debunked ideas about racial separations and superiority. Biological anthropology denounces the effects of racism and those who have fought against the generosity which should characterize how we share our world. When we use Archaeology to reveal the human past, we find a broad diversity and spectrum of human economic and political arrangements. This record of human life reveals societies which have been much more sustainable than our own societies have proven to be. Although of course societies ebb and flow, the archaeological record reveals dynamic and sustainable forms of life that persist for hundreds or thousands of years. The comparative work of Cultural Anthropology leads us to insist that no one form of human life is “natural.” There are no bedrock or natural roles for sexes and genders; for parenting; for kinship; for economic systems; for political organization. The social inequalities we observe are not inevitable. We can live differently, whether that means providing healthcare as a human right or curtailing gun violence. Cultural anthropologists have gained these perspectives through this process of radical listening and what we call participant observation. As Ingold describes, participant observation “enshrines an ontological commitment” that is fundamental to the discipline of anthropology (2017:59). Based on anthropology’s generous, open-ended, and comparative observations, we are forced to take a critical (or even revolutionary) stance on many social positions. Participant observation as anthropology “requires, even forces, one to throw away one’s assumptions about the world and seeks to understand social life anew through our engagement with distant others and their social relations” (Shah 2017:56). Anthropological research reveals that prejudice should not masquerade as science. But the science of anthropology must be taught again and again and again. Anthropology should be a counterpoint to the Western project that has left our world in a precarious state. “We anthropologists have tremendously important things to say, and we need to be there to say them” (Ingold 2017:24). Linguistic Anthropology has long taught us that dialogue is at the heart of being human: See the January 2018 What is Linguistic Anthropology? on Brave New Words. We can use language, and dialogue, to expand these boundaries and conversations. Anthropology is fundamentally optimistic about the possibilities of dialogue and human life. Anthropology allows us to “speculate on the conditions and possibilities of human life in this world” (Ingold 2017:24). That said, it is important to realize that academia and the university have also been places of exclusion, hierarchy and intolerance. As linguistic anthropologists Nelson Flores and Jonathan Rosa put it, “the challenge is transforming institutions that have inherited a legacy of systemic racism into spaces that are truly anti-racist. This project of creating anti-racist institutions requires a careful examination of the fundamental logics that privilege or marginalize particular modes of institutional participation and communication” (Political Correctness Is Not the Problem, Systemic Racism Is). Anthropology is more comfortable offering critiques than positive alternatives, but the possibility exists to combine our critical proclivities with non-prescriptive, ethnographically informed positive alternatives that engage public policy debates. If a society’s goal is to have people live meaningful and fulfilled lives–and not just increase income and consumption at all costs–then we should look to ways to help people realise their longer term goals, the moral projects of their lives, affluence (and its converse, poverty) as seen in all of its multiple dimensions. . . .
One of the main goals of Living Anthropologically for 2018 will be to infuse these statements into the framework of introductory anthropology courses, and in so doing make the positive possibilities of anthropology available to wider audiences. For my latest attempts, see the Introduction to Anthropology 2018 outline (with Lavenda & Schultz) and Intro to Anthro 2018(with Welsch, Vivanco & Fuentes). My take on anthropology has been very influenced by Tim Ingold, and I use his The Perception of the Environment: Essays on Livelihood, Dwelling and Skill for my course on Cultural Ecology. 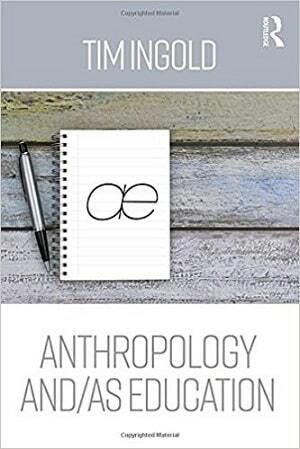 For this “What is Anthropology?” essay I’ve quoted from Ingold’s contribution to Hau: Journal of Ethnographic Theory, “Anthropology Contra Ethnography.” There are many perspectives and debates within anthropology, and the Debate Collection of Hau contains other essays which take issue with Ingold’s perspective. It seems that Ingold’s essay was a precis for Anthropology and/as Education, and so I quote from the book where possible. My perspective on “What is Anthropology?” is also molded by the late Michel-Rolph Trouillot’s work, especially in Global Transformations. I have used Trouillot for Cultural Anthropology 2016. For more information, see the Trouillot Bibliography and the guest post on Teaching Trouillot. Although Ingold and Trouillot seem to approach “What is Anthropology?” from very different vantages, their ideas about the place of ethnography and the social role of anthropology often coincide. The American Anthropological Association has a useful “What is Anthropology?” page which details the disciplinary subfields. I am a co-editor for the Open Anthropology project which curates articles in their journals for a one year free to read period. In some ways, the question of “What is Anthropology?” is answered by what anthropologists do. The Anthropology Blogs page provides resources to keep up with what anthropologists do and how Anthropology Matters. To cite: Antrosio, Jason. 2017. “What is Anthropology? Critical Inquiry into the Conditions and Potentials of Human Life.” Living Anthropologically website, https://www.livinganthropologically.com/what-is-anthropology-2017-human-life/. Posted 12 November 2017. Revised 10 February 2018. For a previous version of “What is Anthropology?” see the archived 2011-2013 page which originally appeared on Anthropology Report. If you are reading this for a class on “What is Anthropology?” please use a social share button or make a $1 contribution to keep anthropology resources online, updated, accessible. Thanks! كلية العلوم الانسانية والاجتماعية- جامعة بسكرة.